Wabi-sabi is a confusing concept, especially for us Americans who tend to strive for more and better and more. This isn’t to suggest that we shouldn’t strive for better or what we need, but part of the concept of wabi-sabi is acceptance for what we have. Further it is in part accepting that nothing is perfect, that life is impermanent, and that there is beauty in not only the cracks but the differences. This is where I think wabi-sabi deserves a place in every art journaler’s list of things to read. I’ve noticed an uptick in people posting really polished pages out of their art journal to AJNing, the original as well as other places on the internet. In fact I’d say YouTube is rife with beautiful polished pages. What I’ve always found interesting about art journaling, and journaling* in general, is that the journal is a tool, and the most interesting journals I’ve seen are those that involve the struggle and document the work. 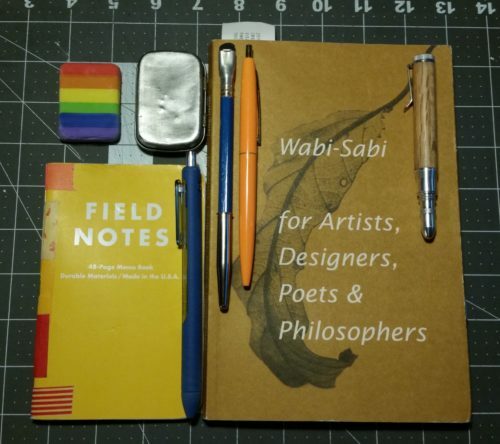 This struggle is where the concept of wabi-sabi overlaps with journaling and where I think many journalers need to consider accepting their pages and journals as they work on them. Acceptance seems to be a large part of wabi-sabi, it’s also a key component of mindfulness. Wabi-Sabi takes that acceptance a step further and not only do you seek to accept things in their imperfection, but you strive to see the beauty inherent in their imperfection and unique individuality. This is the part of wabi-sabi that is most important to a journaling practice, being able to accept the imperfection that you have created on the page, and allowing yourself to see that this is a reflection of the self. Anyway, I chose to look a little more closely at this book because like next week’s SSS, Writing as a Way of Healing, it deeply speaks to my journaling practice and has influenced my thinking of acceptance of both myself and my art. This entry was posted in Journaling, Reflection and tagged journal art, journaling, secular, sunday study, wabi-sabi on 20161016 by leslie. Generally speaking, I really hate it when someone tells me, “I think you should read this book. I read it and loved it.” I don’t know why I hate that. Maybe it’s because I spent so much time as a scifi nerd in high school. When my professor said to me, “I think you should read some of Brene Brown’s work. I think you’d benefit.” I smiled and didn’t read it. After all I had the perfect excuse for NOT reading it, as a busy grad student, when am I supposed to find the time to read anything other than what I am assigned to read? This summer I had no classes. I caught up on some of the readings I had skipped and not read. Finally around August I was done with the reading I wanted to do for pleasure and the stuff I hadn’t read for school. I remembered my professor’s suggestion, Brene Brown. You know her, the Oprah art journaling woman? Yeah her. Anyway, I searched for her books on my local library’s website and found they had a bunch of her books as eBooks. I requested them and then… waited. With one I just got it and the other I’m the 11th person who has requested it. I’m reading Daring Greatly and so far I’m really enjoying the books and she makes some really fantastic points. I’m also looking at it as a source for art journaling and art therapy. In the few chapters I’ve read she asks some questions of the reader that I think would make excellent prompts for art journaling that would not be too deep for journalers to use on their own. Which is a failing I’ve found in many books dedicated to art journaling. The authors ask the reader/journaler to go too deep without the help of a therapist. Perhaps what my professor was suggesting wasn’t just that I read about vulnerability but also how one can write a fantastic prompt that is not harmful to the user. Maybe she thought I”d simply enjoy these books. Either way I’m getting a lot out of the first book. Enough that I’m continuing to read it though I don’t really have the time. This entry was posted in Uncategorized and tagged art journaling, brene brown, grad schoool, journaling, reading, school, vulnerability on 20140914 by leslie. I took a bit of a blog writing and reading break the last month. It was an unintended consequence of having the flu, then allergies and then the DayJob needing me to adapt my schedule. I realize I do this pretty frequently. I stop reading everything I can get on my screen and mindlessly wander Hulu in search of some mindless entertainment. 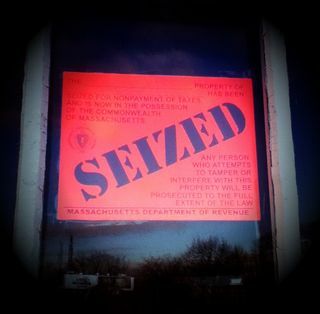 I look at this as time for my brain to get calm from its typical go-go-go NorthEastern work ethic. Normally I wake up thinking and go to bed thinking. Non stop. Except during this typically brief sojourns from reading and writing blogs. It’s like my mind says to me, “Screw you, I CAN’T GO ALL THE TIME. I need a DAMN break. So I’m taking it now, even if it isn’t convenient for you.” And, so, my brain takes a break, greedily sucking up X Files and Grimm episodes and taking a break from things like, that fountain pen class which I’ve been researching and writing for too many months, or one of the million other things I’ve got going. Somewhere in the middle of all of it, I beat myself up about not working on the stuff that drives me, but then I realize this is part of my process. I need this time to creatively recuperate. My brain needs downtime from my art just as we all need downtime from our DayJobs. It’s just how it is. I write this to encourage you to take the downtime you need and so you don’t beat yourself up about it. This entry was posted in Journaling and tagged break, hiatus, it's okay to take a break, journal, journaling on 20120417 by leslie. I was doing some comparison shopping for my upcoming class on pen and ink drawing and I stumbled upon the Loew Cornell Fine Tip 4 pack at Joann’s for $5.99. They claim to be water resistant and non- bleeding. One look at the package and you can tell they are clearly a knock off of Pigma Micron pen put out by Sakura. The short cap, metal clip, and cap post on the end of the pen gives it away. The markers are sold in a blister package with some claims and suggestions. The first claim is that they are water resistant. The second they won’t bleed. 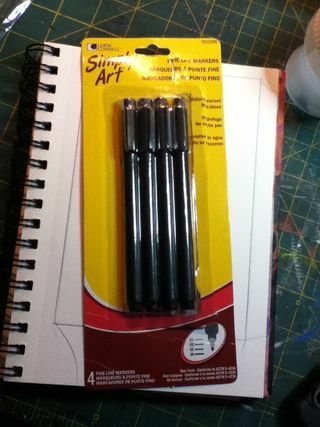 The back of the package suggests that you can use them with watercolors and other markers. I’ll get to these claims shortly. 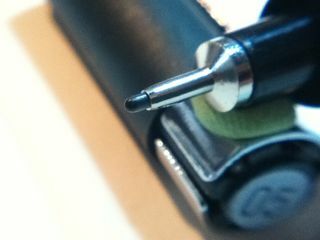 The pens have a matte black barrel that is comfortable to hold. The pen is very lightweight. 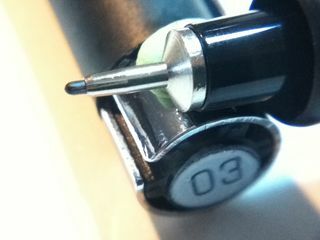 The cap posts securely to the back end of the marker with a satisfying click. 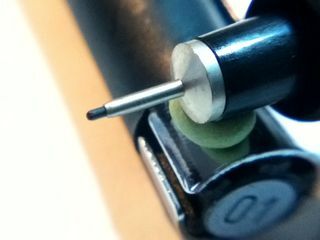 While writing with the marker I found the ridge where the nib section meets the barrel to be quite sharp and uncomfortable. 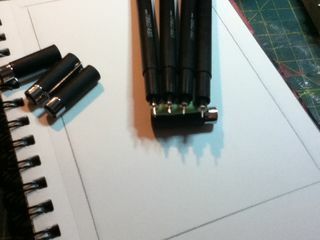 I suspect that this will be the main reason I stop using these markers. 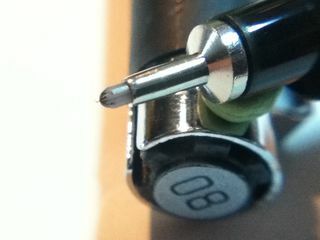 While writing I found the fiber tip to be quite smooth on all pens but the largest, .08, and that nib was dry, as if it had dried out in it’s packaging or was out of ink. 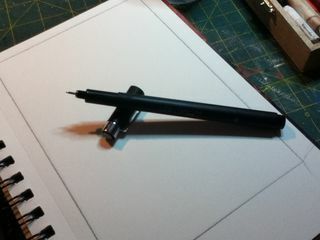 The sketching experience was not bad at all, the line was smooth and consistent for each tip. There is no line variation unless you switch pens. 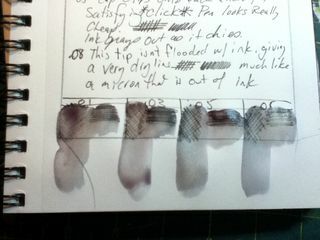 The ink is black but seems to gray out as it dries, leaving behind a dark gray line rather than a black line. An additional flaw is that the cap is the only part with a size designation and it’s easily missed so caps could easily be put on the wrong pen. The barrels are only marked with the Loew Cornell name. As for the water resistance, they are, sort of. I found that a lot of the ink lifted with a fast brush over with water. Leaving behind a strong gray area in any spot that was damp. There was a LOT of bleeding that would discolor any watercolor wash applied over it. This also washed out the lines. I went over my test area with another brush load of water and worked the area with the brush, nothing that would be called a scrub, and with a soft brush. The thinnest lines lifted almost completely and black lines were left grayer than before. The gray that is left is a very nice color. Knowing that these create a wash like this is actually pretty useful, one could throw these into a sketch kit with a waterbrush and get some pretty nice sketches with a wide range of tones of gray. All in all these aren’t a bad value for $6 as long as you take the negatives into consideration- the grip itself, that one of the 4 pens I got wasn’t working properly, they are kinda water resistant, and that only the cap is marked for size. On the good side of things, you get 4 markers that write a lot like a Micron for a lot less, make wonderful washes, are all black and write pretty smoothly. I’d recommend these for anyone who is interested in trying out this style of pen- very fine fiber tip. I don’t think these will sell you on the style though, they are too uncomfortable to write/sketch with for long periods of time…. Though a nail file might take the sharp edge off the grip area… Might try that, if I do I’ll let you know all about it. I want to suggest these for kids, but I don't want people to assume that I'm saying they are only for kids. I guess I'd say these are good for older kids- teenagers who are sketching for art class, or are writing or for someone who wants to test this style of pen out. you won't get the same performance as you would with a Micron but it's a good point to start. UPDATE: I have been using these in SOME of my cowboy sketches and I've found them far more comfortable to sketch with than I'd have expected. We're not talk ing 2 hour long drawing sessions, more like 15 to 20 minute drawing sessions. I amend my previous statement about them being uncomfortable to being mostly comfortable for sketching. Add to that the blending capability when water or ink is added really adds an other level of darks to my gray ink brush pen. I'll need to test it and see if it's lightfast before I suggest it for anything other than sketching. 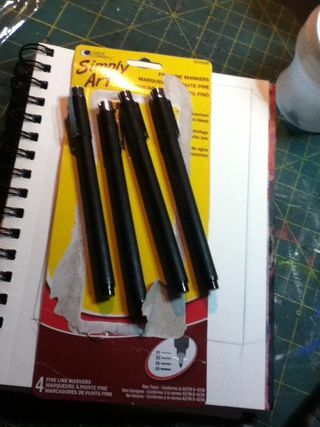 This entry was posted in Review and tagged cheap, drawing, journaling, knock off, loew cornell, micron, pigma, sakura, sketching on 20120202 by leslie. I want to take a brief moment and thank everyone for coming by my blog and reading. You give me constant inspiration and enjoyment. I truly enjoy and read every comment, though I can't always comment back (I hope that changes in the coming year) I want to thank YOU all for commenting and making this past year wonderful. I hope that your holiday is as warm and bright as mine is shaping up to be. I wish you love and happiness for the holiday and the upcoming year. Make art! As a thank you to all the blog readers, I'm announcing here first that I'm going to offer OSA: Drawing 101 as a self study session. You can read more about it here. 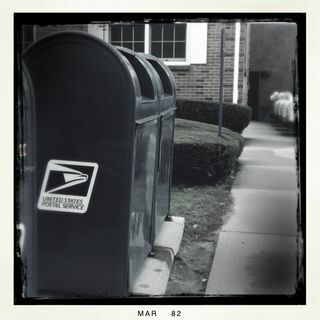 This entry was posted in Uncategorized and tagged art, drawing, holidays, journaling on 20101224 by leslie. The first class in the Art Habit program will be focused around journaling, written as well as art journaling. Most of you know I’m an avid journaler and have been since I received my first diary at age 10. I’ve written almost every day since then. (We won’t talk about college, m’kay?) 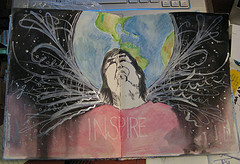 I think that written journaling goes hand in hand with art journaling. When you can’t find the words art helps and when you can’t find the right shape or color writing helps. So this class is more of a self paced workshop, set 4 weeks long, featuring 4 mid-sized PDF of prompts, questions and text. The goal is to take the PDF, read it, mull it over and start to use it as a guide for directed journaling. What I mean by directed journaling is when you focus on one particular word, or question while you write or make art; or you ask yourself a series of questions as you write or create art. Some of the questions are designed to get you thinking about the world around you others are designed to make you look within yourself. This may look like the easiest art journaling course created but it’s probably the most difficult I’ve written. The questions are hard, they make you think and explore your thoughts and feelings on a subject. These are questions that I use in my written journaling on a daily basis. This course comes from YEARS of journaling. I have not decided if I’m going to do a video component to the class or not. We’ll see. I’m very excited about this particular workshop and its implications for each person’s journaling. I know that when I use these directive questions my journaling becomes much more productive and useful. Like I said, I’m very very excited. This entry was posted in Uncategorized and tagged art, craft, drawing, habit, journaling, paintingartjournaling, writing on 20101207 by leslie. It’s been a long week for me. 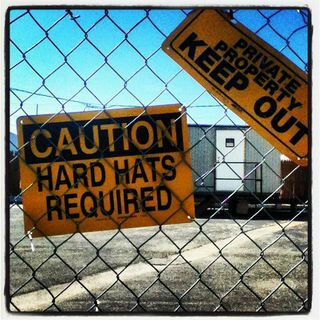 The holidays always represent an increase in DayJob related work. It’s just how it is. I’ve grown accustomed to this shift but it’s hard to explain to those around me. That being said some things have been really cool. #1.) We released a holiday issue of the eZine which you can find here. #2.) I had my first in person live class in years and it went well. #3.) And I’m developing 2 new classes; one based around prompts and one around painting. I have more to say but right now I'm dead tired and need to catch some Z's. Also for those of you who are wondering, we have been having hellish issues with our internet service since the DNS went down at comcast. We've rebooted the modem, the computers, chatted with comcast and flushed the DNS on our modem, stopped and dumped it and restarted it. For awhile the internet will run smoothly, then 15 minutes later crap. So we're looking into other service providers and we'll see how that works out for us. While chatting with comcast the agent who was supposed to be helping me with my issue instead told me that my service package sucked and that I should upgrade. BEFORE MY ISSUE WAS RESOLVED. How about you help me fix my issue before you try and upsell? Anyway, I'm unhappy, my internet is not happy and hopefully high speed will be fixed by sometime in the middle of next week. This entry was posted in Uncategorized and tagged art, class, dayjob, drawing, journaling, online, painting on 20101204 by leslie. I've been working on my travel journal for my upcoming (no fun) trip to Maine. I'll be up there for almost 2 weeks. I don't usually take my acrylic paints with me and I know that I'm not going to have the time I often have to work on the pages with watercolors. I like to work on colored pages so I've gone through and I've collaged into the journal random images from Mother Earth News, Wine Enthusiast and some collage papers. I've gesso'd the pages then used thin acrylics to color each page. After that Iused watered down acrylics in 3 colors to tone down and grunge up the pages. I'll be doing a whole video on that soon. Anyway, here are the videos! When I finish filling this journal I'll be doing an art journal flip video. I may try to do some process videos too. I'll have my cameras with me when I'm traveling, so we'll see. This entry was posted in Uncategorized and tagged art, book, draw, journal, journaling, sketch, sketchbook, travel on 20091115 by leslie. I've been silently reading Ricë Freeman-Zachery's blog for awhile now. I've also been watching her videos on YouTube and had a few of them up here recently. Her work is great and I've been loving her blog. Head over and give it a read as well as check out her podcasts. It's well worth the effort, believe me. This entry was posted in Uncategorized and tagged art, cafe, journal, journaling, podcast, rice, voodoo on 20091111 by leslie. I had to think to myself what inspires me, then I had to think what doesn't? This is my way of thinking about that. I sketched out the globe behind the figure first and then sketched in the image of the face, uplifted and with a smile. The next time I decide I want to draw a face on the fold punch me in the throat. I used my ink brush (fine koi water brush filled with india ink) and inked in the face, body and around the world. I used watercolors to add color to the world and deliberately left the face black and white. I colored in the "shirt area" with watercolor pencil. 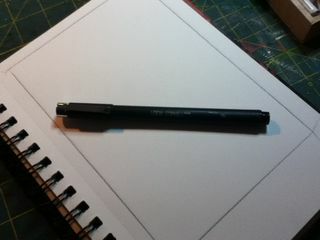 Using a brush I filled in the black background with india ink and a brush. I spritzed the shirt area with water to allow the ink to run down it. I hit all that with my drier and dried it out. I then used my gelly roll pen to add some fine line doodles and swirls. I used a brush with liquatex silver ink to add more depth and then added some white acrylic to add more swirls and doodles. You can't see how awesome and neato the silver ink is in the pictures. Also the curve in the face distorts the face more than it is in reality and makes the whole thing look kinda weird in the photo. I'm not overly happy with it as a finished piece, but I tried to make this a little less complex than the last few images I did. This entry was posted in Uncategorized and tagged art, craft, doodle, journal, journaling, nanojoumo, sketchbook on 20091103 by leslie.